This is the Mil Mi-26 heavy transport helicopter, the most powerful series production helicopter in the world. Built for the previously publicised ‘Brickman Awesome‘ show, Certified LEGO Professional Ryan McNaught (aka The Brickman) and his team spent 52 hours and 8,302 bricks in the construction of the Mi-26. Anyhoo, there’s more to see of Ryan’s amazing Mil Mi-26 at his Flickr photostream via the link above, and you can see more of Ryan’s models built for the Brickman Awesome show by clicking here. Certified LEGO Professional Ryan McNaught (aka The Brickman) is back! The Brickman Awesome event is touring Australia and New Zealand throughout 2018, having taken over 4,500 hours to create and built from a whopping 1.5million LEGO bricks! 290 of those hours and over 65,000 pieces belong to this, Ryan’s incredible replica of Doc Brown’s Delorean DMC-12 time machine from the Back to the Future movie franchise. Created in conjunction with Universal Pictures the DeLorean took a team of seven people to design and build, and includes lighting and in-built smoke machine hidden underneath one of the largest plate-built exteriors that Ryan’s team has ever built. There’s a whole lot more to see of Ryan’s unbelievable Back to the Future time machine replica at his photostream via the link above, and you can also check out some of the other models built for the Brickman Awesome exhibitions – including a 460,000 piece, 7.5 meter tall, half a ton replica of NASA’s SLS rocket – by clicking here. Certified LEGO Professional Ryan McNaught (aka TheBrickMan) is back, and with one hell of a ride! This is a 2018 Harley Davidson 48 motorcycle, and it’s life-size! Built in a perfect 1:1 scale Ryan’s build uses over 64,000 LEGO pieces and took a team of three builders over 200 hours to create. The motorcycle is 100% LEGO aside from a metal frame inside to allow for easier transportation (meaning this model can be ridden!) and working lights front and rear, and is part of the Brickman Awesome Lego show that is touring Australia and New Zealand this year. There’s lots more to see of Ryan’s amazing 64,000-peice life-size Harley Davidson 48 at his Flickr photostream, where you can also check out other builds from the Brickman Awesome Lego show including a huge mini-figure scale Antonov 225 aircraft, and you can read more about the show and book tickets via The Brickman website by clicking here. Certified LEGO Professional Ryan McNaught is a veteran of these pages with his incredible (and massive) commissioned creations. This is his latest, designed and built by a team of three builders and containing almost 24,000 LEGO pieces, Ryan’s Volkswagen Beetle (complete with a brick-built oil leak!) took nearly 100 hours to construct. The build pays homage not only to Volkswagen’s iconic People’s Car (the most produced car in automotive history with over 21 million made) but also to the official LEGO Volkswagen Beetle set of 2008, a product which paved the way for the hugely successful authorised manufacturer partnerships that LEGO fans are benefitting from today. There’s more of this spectacularly impressive build to see at Ryan’s Flickr photostream, where you can also find a link to his website and previous works. Hitting over 100mph in 1934, the Flying Scotsman steam locomotive is one of the world’s greatest trains. This outstanding Lego replica is the work of Certified LEGO Professional Ryan McNaught (aka TheBrickMan), and it’s built from over 165,000 LEGO bricks, measuring over 10ft in length. There’s more to see at Ryan’s Flickr photostream – click the link above to climb on board. This, ladies and gentleman, is the best creation you will see in 2014. It’s the best creation we have ever publicised. It’s probably the best Lego vehicle in the world. This is a Ferrari 250GT California built by Certified LEGO Professional Ryan McNaught aka ‘thebrickman’. The Ferrari 250GT California is one of the world’s most sought after cars. Appearing in the 1980s cult film Ferris Bueller’s Day Off (sort of – the movie’s most famous scene actually used a disguised MGB) did 250GT values plenty of favours, but it was already world-famous long before its starring role. In the early ’60s Ferrari 250s were driven by Steve McQueen and James Coburn amongst others, and it’s Coburn’s own vehicle that holds the record for the highest price ever paid for a car at auction; $10.7million by British radio and television host Chris Evans in 2008. Ryan’s astonishing recreation of the 1961 masterpiece contains an estimated 50,000 LEGO bricks – making it almost 1:4 scale – and took him almost four weeks to build. The beautiful photos shown here come from Ryan’s Flickr photostream, and you can view the complete gallery via the link at the top of this post. We also highly recommend a visit to Ryan’s website www.thebrickman.com where you can see more of his commission pieces, and you can read about life as one of only thirteen Certified LEGO Professionals in the world. This enormous orange behemoth is an Erickson Air-crane, nicknamed ‘Elvis’. At over 4m long and 1m high it contains over 100,000 LEGO bricks. Pro builder Ryan McNaught, aka TheBrickMan, spent one month designing and building this creation for the Brickvention 2013 show. You can see more of Elvis at Ryan’s Flickr photostream here. Uhuhuh. Bam, Zoom, Straight to the moon! Ever wondered what mankind’s largest vehicle would look like if it were mini-fig scale? 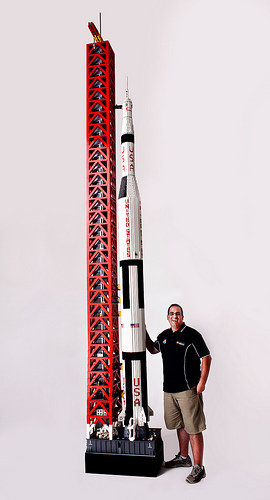 Ryan McNaught, a certified LEGO professional, shows us just how massive the Saturn Space Programme rockets were with his 19ft Apollo 11 Saturn V rocket. 120,000 LEGO bricks went into this astonishing creation, which you can view in glorious detail by clicking his name above.